We have been using Shapeways' 3D printing service to produce parts that we desire with great success. In this article, we want to document our experience with the handling of various materials that we printed through Shapeways. Shapeways 3D Printed parts are available in various colors and are polished. We've ordered a "Green Strong & Flexible Polished" part to see how it compared to "White Raw Plastic". Texture wise, there is very little difference between the polished plastic vs. the raw plastic. The difference is in the sub-millimeter level. You can see the slightly rougher texture using light reflection, but you can hardly feel it under your finger tips. Using light reflection, you can see that the polished surface is more uniform than the raw surface. We had an opportunity to shave our part for it to fit our project properly (see photo above). What we found is that the colored polished part is really just a standard white raw plastic part that has been polished and dyed on the outside. The dye absorbs about 0.5mm into the surface. 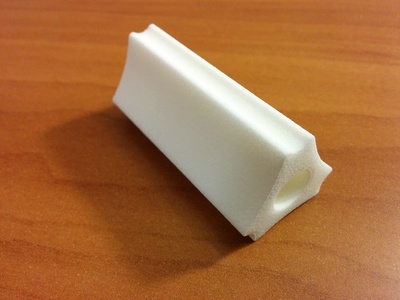 We printed with the white raw plastic the most, because it is the strongest material, based on Sculpteo's FAQ. The white raw plastic has a matte texture surface that reminds us of sugar cubes. However, it doesn't crumble like sugar cube. The white material attracts dirt. Rubbing on it with our bare dirty hands turns the white plastic black, eventually. The following photo gives you an idea of the white raw plastic. The white plastic is extremely resilient. It provides full strength at thickness greater than 3mm. At 2mm, it is bendable and flexible but does not break. Metal file does very little damage to it. It takes great effort to file away 1mm of material. Drilling requires torque. Once the drill bit has cut into the plastic, you really can't manipulate the depth like wood; it will completely drill through. Therefore, specialized holes should be modeled and printed, not drilled later on. The plastic can be cut with a hobby saw or a hack saw. Because of its resilience, cutting without downward force will result in smoothing/filing the cut. Therefore, to actually cut through the plastic, a decent amount downward force must be applied. The material can be painted quite easily with or without primer. It seems to absorb paint, therefore, it is readily paint-able at a wide range of temperature.